Other than participating in the Hampstead Farm's CSA, we also signed up for a meat share through Randle Farms this fall. For our first pick up, we got some nice, tasty steaks, ground beef, and liver. Cooking with liver was a first for me. Since we had so much of it, I decided to make a pate. In a medium saucepan, heat 2 tbsp of butter and saute liver, onion, garlic, thyme and rosemary. Add the wine and bring to a simmer. Cover, reduce the heat to low and cook, stirring occasionally, until the livers are barely pink inside and the wine is evaporated. Add lime juice. Remove from the heat and let stand, covered, for 5 minutes. Transfer the liver, onions and garlic to a food processor; process until coarsely pureed. With the machine on, add the rest of the butter, 2 tablespoons at a time, until incorporated. Season with salt and pepper and process until completely smooth. Scrape the pâté into 2 or 3 large ramekins. Press a piece of plastic wrap directly onto the surface of the pâté and refrigerate until firm. 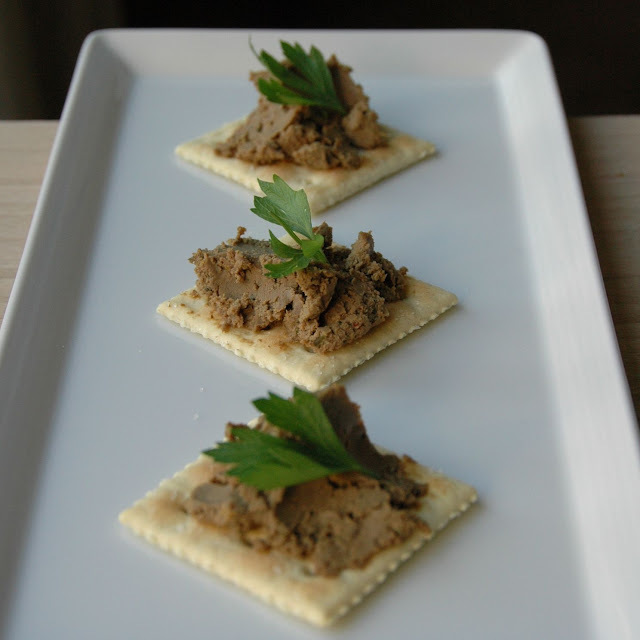 Serve chilled over saltine crackers garnished with parsley.